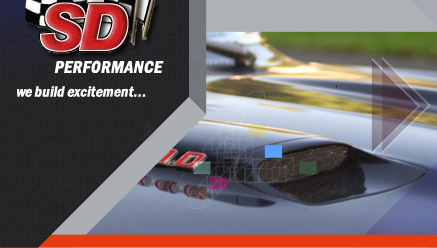 SD Performance spends an extensive amount of time on the dyno, at the track and on the street to develop some of the best performing Pontiac ported cylinder heads on the market today. SD Performance has more 5 Axis CNC Porting and Combustion Chamber Programs for Pontiac heads then anyone and we are constantly working on more and improving existing programs in our never ending search for more pure Pontiac power. All of our heads are flow tested on our state of the art computerized Superflow 600 flowbench equipped with velocity probes, but we’ve learned that what really counts, is how our heads work in the real world. A flowbench is a great tool which we use daily, but there is more to an efficient head than just flow, too many put their faith in flowbench numbers alone. If you already have a set of Edelbrock heads we can apply all our packages or just porting to your existing heads as well, drop us a line for more details. SD Performance has developed our own CNC machined 87cc combustion chamber which we machine into Edelbrock 72cc heads (old style castings), on a back to back dyno comparison our 87cc chamber required about 2 degrees less timing when compared to the std. 87cc Edelbrock combustion chamber (less timing indicates better combustion efficiency which equates to more power with less fuel required and less chance of pre-detonation). We are also able to custom size chambers from 74-90cc's. If you own a set of 72cc heads and want a larger chamber we can take care of that, shoot us an e-mail at techsupport for more details. Precision assembly - SD Performance precision assembly means, we test ALL valve springs on a digital spring tester, and set ALL installed heights individually to equalize the springs as close as possible. shoot us an e-mail at techsupport for more details. OPTION: Aux. Oil Drain Back holes are a no cost option for all Edelbrock head packages 340cfm and up. Holes (one on each head) are drilled and tapped for 3/8" NPT threads and are right in line with the rear oil drain back hole and exit above the rear exhaust port. Don't Forget, all Aluminum heads will not work with OEM head bolts and require new Head Bolts or Head Studs, we have ARP fasteners in stock from $82.95. Street Edelbrock heads, setup for hyd. flat tappet or solid or hyd. roller cam, includes everything above, fully CNC ported to flow 315+cfm@ .600” lift @ 28”, no extra cost valve size options, 2.11” intake valves, 1.66” or 1.77” exhaust valves. Intake Port entrance is matched to RAIV/Felpro 1233 size. More flow throughout all valve lifts compared to out of the box Edelbrock heads with better components installed for only a few dollars more!!!! This package is designed to give the absolute most bang for your buck, SD gives you more for less$$$, no one offers this much cylinder head for the same money. Street/Strip Edelbrock heads, setup for hyd. flat tappet or solid or hyd. roller cam, fully custom assembled with Ferrea stainless steel valves etc. ready to bolt on out of the box!! !, CNC ported to flow 265cfm @ .400" lift, 295cfm @ .500" lift 320-325cfm @ .600” lift @ 28” with 2.19” intake valves, 1.77” exhaust valves. Custom tailored chamber sizes at no extra cost!! Edelbrock head package up to 340cfm on a 4.185" bore and up to 350cfm on a 4.250" or larger bore @ .700" lift. The heads feature 2.200" intake valves for stock block combo's, 2.250" intake valves for larger bore aftermarket block combo's (Note we have to use the old style casting for the larger valves as the valve seats Edelbrock installs in the newer CNC'd chamber heads do not have a big enough dia. for anything larger than 2.200") and high flowing tuliped 1.740" exhaust valves. The exhaust port CNC program is borrowed from our wide port Edelbrock package. These heads on a 10.6 to 1 498ci engine (400 block 4.195" bore 4.5" stroke) on 92 octane produced 700hp @ 6200rpm and 647b/ft of torque @ 4900 rpm with a very street friendly hyd. roller camshaft topped with a port matched Victor with our CNC machined plenum. On a 541ci 10.8 to 1 pump gas engine with one of our custom solid roller cams these heads and matching CNC ported and hand finished Victor intake produced 784.3hp @ 6700rpm and 687.5 lb/ft of torque @ 5400 rpm Here's a link to one of our customers track testing www.sdperformance.com/customerCars_01.php?carID=161 Prices start at $1650.00 each for a flat tappet/hyd. roller package and are a great choice for your big inch street/strip or bracket race build allowing the use of std. valvetrain components. Own a set of Edelbrock heads already? We can apply these new bigger flow packages to your existing heads also!! CNC ported and hand finished Victor intake now available, our CNC machined and hand finished plenum showed 20-25hp gain over an as cast cloverleaf plenum on a back to back dyno test, call for details and pricing!!! Offset Shaft Rocker Race Heads, CNC ported to flow 370cfm @ .750" lift with 267cc intake runner volume. These heads utilize a higher velocity port design with more mid lift flow when compared to other wide port heads on the market and only require .500" offset shaft rockers and .180" offset lifters, reducing pushrod angle which improves valvetrain stability. These are the ultimate Edelbrock race heads! Capable of producing 900+hp on race gas and we've made 825+hp on pump gas with these heads and our matching Victor intake, e-mail techsupport for more details. Crower Stainless Steel .500" Offset Shaft Rockers and Crower .180" Offset lifters With High Pressure Pin Oiling Option In Stock, e-mail techsupport for package pricing. Edelbock Victor 4500 intake, CNC ported runners and plenum with hand blending and finishing (dyno testing showed 20-25hp gain over as cast cloverleaf plenum) to properly match our CNC ported wide port Edelbrock heads. Each runner is flow tested to make sure it flows what it should to make max power. In addition to the porting, we CNC machine the top of the intake runners for valve cover clearance, clearance the center runners for bolt clearance as well as separate the water crossover for easier port alignment.